I'm crazy. That's how you can describe me this past week. Over the years, I have been looking for a keyboard to replace my old Acer mechanical. The ThinkPad USB Traveller keyboard didn't quite make it. It is rubber dome, not mechanical. My next keyboard has to be mechanical like the Acer but as I ventured into the mechanical keyboard world, I find myself going through a looking glass. It's a whole new world! This is not going to be a cheap hobby! So, over the past few days, I bought two mechanical keyboards: the Razer BlackWidow Ultimate 2013 (read my thoughts in this link) model from a friend, brand new, at a discounted price. This is based on Cherry MX Blue switch. At the same time, someone posted a Choc Mini mechancial keyboard for sale in lowyat.net forum. And this guy owned 3 Choc Mini in Blue, Brown and Black switches. He didn't like the Cherry MX Blacks, so he decided to sell it. It's brand new, in a way, but it is a 2011 model, meaning still 2 year old. His asking price is RM180 (original price is likely RM250 not counting shipping charges from China). To read more or to see a full dissertation of Choc Mini keyboard, take a look at this post in overclocker.net here. If I have time, I will give you my impressions later. My craze propelled me to learn more about mechanical keyboard, so let me spend some time to share what I have learned. Mechanical keyboards are called such because the technology behind each key is not electronics but made of individual parts working seamlessly together. Meaning, there are no electronic chips or diodes in it. They are mainly made by parts that can, in theory, be taken apart and replaced; some users even grease them to 'oil' the parts so that they are smoother when they rubbed against each other. These things under each key is called a switch. In a 101-key keyboard, there are 101 switches. This is the reason why mechanical keyboard are expensive, because of the 101 individual switches. Switches comes in many types. Like a car engine, there are many makers - the engine served the same purpose, to turn the tyres to take you from one place to the other. But each car engine gives the driver a different feel. Driving a Honda feels different from a Toyota to a BMW and a lower quality Proton. If I asked you to describe how each car drive, it is hard to do so. It's just a feel. Similarly, a keyboard is meant for you to type words to appear on the screen but each switch gives you a different feel and can make typing or gaming a pleasure or gives you RSI instead (yes, mechanical keyboards are claimed to reduce RSI in your writs and fingers.. so if you have RSI, try a mechanical keyboard instead). This feel of the key presses is sometimes called tactile. Tactile switch gave a distinct feedback after you pressed them. It bounced back and hit your finger tip. Mechanical switches does not require you to press the key all the way down to register, so you can type on them lightly, which is why it helps reduce RSI. 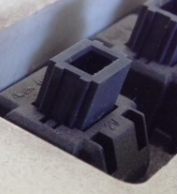 The ultimate switch, the Rolls Royce engine of all mechanical keyboards is the buckling spring switch found in IBM Model M keyboard. Anyone from the mainframe era would have tasted the super noisy but damn good feeling of the buckling switch. If you still have the IBM Model M keyboard or know someone who does, you can still sell this 20-30 year keyboard at RM600 or more today! But if you still like buckling spring and cannot find or afford an original IBM Model M, you can still buy a buckling spring keyboard from Unicomp. This Texas-based company manufactured keyboards for IBM from years ago. They continue to do so today. They are the nearest original IBM keyboards manufacturer you can find in modern times. And it's not expensive either, around US$90 for a keyboard. The only problem? They have not modernise the look and feel of the keyboard, so it is still very ancient and very ugly! The other popular switches are Cherry MX switches, Alps switches and Topre switches. Let's start with Alps. Alps switches are found in PCs (or Apple Macintosh) which dated back to around 20 years ago. My Acer keyboard have Alps switches. Alps is made by a Japanese company called Alpine. Sounds familiar? This is the same company that now sells a premium car stereo, Alpine. The same company went from keyboard switches to car stereo. Alps are also used in Apple Extended II keyboard, so even the early users of Apple Macintosh would have used a mechanical keyboard. Alps switches looked like the photo on the left, after you plug off the key cap. It's a distinct style. Today, there is one company that made keyboard based on their own customised alps switch. This is a Canadian based company called Matias.ca. Their intent is to create the same mechanical keyboard as the Apple Extended keyboard II, so their flagship product, Matias Tactile Pro, is targeted at the Mac community. The other switches, the more popular and mainstream ones are called Cherry MX. They are easily recognisable by the cross (+) shape of their switches (see photo on the left). These are made by a company called Cherry. The company came up with colour coding of their switches to differentiate how each switch feels. Just like a car engine, we have VVTI, VTEC and what not, Cherry switches come in Blue, Brown, Black, Red, Clear. However, Cherry only make switches. They don't build keyboards. So, many keyboard company will use Cherry switches. The more popular keyboards among internet users are Filco (Japanese based), Ducky, Das (America based), Noppoo (China), Leopold (China), Poker. Filco is considered the best of the best and the benchmark many other keyboards are based on. One of these days, I would like to buy one. Filco is sold and distributed in Malaysia, so it may not be as expensive as importing them from Japan. There are also gaming companies that mushroomed over the past few years trying to capitalize on the mechnaical keyboard craze. These are Razer, CoolerMaster, SteelSeries and they used Cherry MX switches as well. Cherry switches are categorised into two: tactile and linear. Tactile switches are Blue, Brown and Clear. These are how the IBM buckling spring and the alps switch behaves. So, if you loves the tactile feel of these keyboards, you need Blue, Brown and Clear. How they differentiate themselves is whether they are noisy and clicky (Blue) or quiet (Brown and Clear). Typically, tactile switches are great for typing. The other category of Cherry switch are linear switch. These are non-tactlie switches meaning the keys doesn't bounced back after you pressed them. It's just smoothly bottom out and smoothly come back up. The Red and the Blacks are linear switches. Both of them are quiet switch. According to internet, linear switches are great for gaming because when you play games, you bottom out each key anyway, so you don't need a tactile one. You can read more details of how each of the Cherry works in this link in overclockers.net. Interestingly, gaming keyboard makers like CoolerMaster and SteelSeries tend to use linear switch. CoolerMaster has a famous red backlight keyboard base on MX Red. SteelSeries G7 and G6V2 is based on MX Black. The only gaming company I know which use tactile switch is Razer and they have MX Blue and MX Brown. I don't know anything about this switch as I didn't own one nor have any experience with one. Some people swear that this is the best, even better than buckling spring. Others argue that it is not mechanical as it is based on capacitive touch, just like our iPhone screen, meaning it is electronics. To me, this Topre is probably like our hybrid cars, a mix of mechanical and electronics. Topre keyboards are very expensive, much like a hybrid car when it was first introduce. It is at the price range of RM1,000! At the end of the day, a keyboard is very individual. And like a car, you need to take it out for a spin before you get the feel and settle for one. Just like a car, taking a 30 minute spin may not be enough. You gotta use the keyboard for a few weeks before you can conclude if you like it, which make this mechanical keyboard a very expensive and time consuming hobby. To me, I have used the alps for many years. My natural tendency and love is for an alps keyboard. That made my option very limited, which is just the Matias range. I have recently bought a Razer (MX Blue) and a Choc Mini (MX Black). So far I like the Blue better than the Black. It's actually a no brainer because I know I like the tactile feel of the Blue. Linear switch like the Black has no difference to a rubber dome found in laptops today. But since so many gamers swear by Blacks and linear switch, I can't resist not trying a linear switch for just RM180. One day I will do a review of the Choc Mini. Finally, this thoughts are just on switches. A mechanical keyboard is not just measured by switches only. Since most switches are made by Cherry, the switch became the level playing ground if you compare keyboards from different manufacturers. The manufacturers differentiate themselves by the build of the keyboards. This means how the keys are mounted, the materials used to make each individual key caps, the materials of the casing, the design of the keyboards etc. This will be covered one day in another post. Now, you see why it is a looking glass that once you have stepped in, you are caught in this bizzare web of mechanical keyboard world. what would we do if we want to Compare the keyboard prices of these mentioned keyboard ? By the way, this post is very informative.